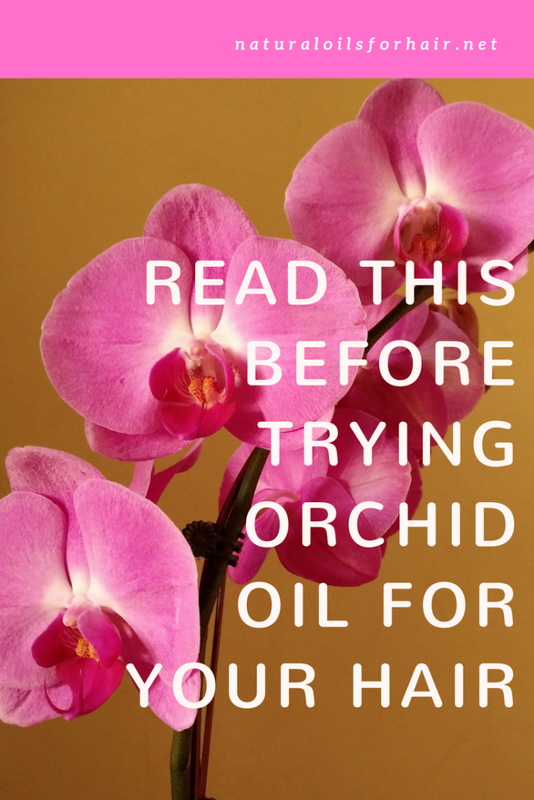 The information available on orchid oil is quite limited. 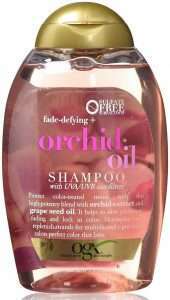 It takes a significant amount of orchid roots to produce just 1 gram of orchid extract. I imagine this would increase the costs of producing it making it less profitable on a commercial level. Hence, it’s mixed with other ingredients such as camellia oil to stretch it. Orchids are part of a family of plants with colorful and fragrant flowers. They grow freely all over the world except in Antartica and are quite resilient. Orchid oil extract’s lightweight quality means it doesn’t weigh down hair, which makes it ideal for finer hair types. Orchid oil extract is easily absorbed, leaving no residue behind after application. Orchid oil extract enhances curl definition when used with other styling products such as leave ins. 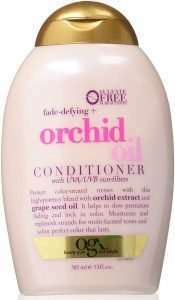 Orchid oil extract assists colored hair to retain moisture and shine better especially hair that’s being chemically treated. These are all very good qualities you want in your oil but unfortunately, as I mentioned earlier, the cost of producing pure orchid oil is so prohibitive that it’s mixed in with other ingredients to make it last longer without compromising its qualities. A few of the other ingredients orchid extracts are mixed into to produce orchid oil include cyclomethicone, dimethiconol and fragrance. If you maintain a strictly natural and/or cone free regimen for your hair, then the first two ingredients will be a problem. If you have sensitive skin or don’t like strong smells in your hair care products, then the third ingredient will be an issue. The first two ingredients can also cause build up on hair and eventually prevent moisture from getting into your strands. Read more about dimethiconol HERE and cyclomethicone HERE. If you are keen on trying orchid oil, you can also make your own with orchid extracts. The next article will cover this in more detail. White Sands Orchids Oil contains cyclomethicone, dimethiconol, caprylic/capric triglyceride (bulbophyllum sp. ), fragrance (Orchids). If you don’t mind the ingredients, you can add it to your deep conditioning treatments or use it as a sealing oil but it will lead to build up. OGX Fade-Defying + Orchid Oil Color Protect Oil contains cyclotetrasiloxane, isododecane, C12-15 alkyl benzoate, cymbidium grandiflorum (orchid) flower extract, vitis Vinifera (grape) seed oil, euterpe oleracea (acai) fruit extract, malpighia glabra (acerola) fruit extract, ethylhexyl methoxycinnamate, phenyl trimethicone, glycerin, butylene glycol, water, fragrance, red 17 (CI 26100), violet 2 (CI 60725). The ingredients are not all natural and contain quite a few no no ingredients when it comes to natural hair care. It is not a pure oil so use at your own risk especially if you have dry hair. OGX Fade-Defying Orchid Oil Conditioner contains water (aqua), cetearyl alcohol, glycerin, behentrimonium chloride, cetyl alcohol, dimethicone, cymbidium grandiflorum (orchid) flower extract, vitis vinifera (grape) seed oil, euterpe oleracea (acai) fruit extract, malpighia glabra (acerola) fruit extract, ethylhexyl methoxycinnamate, dimethiconol, cyclopentasiloxane, polyquaternium-37, propylene glycol dicaprylate/dicaprate, ppg-1 trideceth-6, butylene glycol, dmdm hydantoin, diazolidinyl urea, iodopropynyl butylcarbamate, fragrance (parfum), red 33 (ci 17200). The ingredient list includes cones and some other unfavourable ingredients, which may cause build up and trigger allergic reactions in sensitive skin. Could be used as a pre-poo. OGX Fade-Defying Orchid Oil Shampoo contains water (aqua), sodium c14-16 olefin sulfonate, cocamidopropyl betaine, peg-120 methyl glucose dioleate, ppg-2 hydroxyethyl coco/isostearamide, cymbidium grandiflorum (orchid) flower extract, vitis vinifera (grape) seed oil, euterpe oleracea (acai) fruit extract, malpighia glabra (acerola) fruit extract, ethylhexyl methoxycinnamate, polyquaternium-10, methyl gluceth-10, glycerin, butylene glycol, sodium chloride, citric acid, tetrasodium edta, diazolidinyl urea, iodopropynyl butylcarbamate, fragrance (parfum), red 33 (ci 17200). Though sulphate free, it has a few no no ingredients from the max hydration method list. May cause drying but might work as a clarifying shampoo if you’re planning to strip your hair. While I love a few of OGX hair care products, these three definitely aren’t on my fave list and has ingredients that can be problematic for curlier hair types in the long run. I had come across white lotus or something orchid oil a few months ago but I didn’t pick it up for some reason. Good to know! I believe that was white sands orchid oil you came across. Good choice. There are so many other healthy oils on the market. I’ll be doing a post later on how to make orchid oil once I conclude my research.